How do I accept ground shipments? Once the order is delivered, take photos of the outside packaging. While it may not appear as though the packaging was damaged, the photos are beneficial if there is concealed damage. Concealed damage is when the packaging is not damaged, but an item inside is damaged. Inspect the delivery for any damaged or missing items. While you may not be assembling the items right away, it is important to inspect for damage or missing items. Should there be any noticeable damage, take photos of any damage that the recipient sees. Count the items received to ensure there are not any missing pieces. Match the quantity to the ones listed on the order confirmation. Send all photos, along with the original order number, to customerservice@multitable.com. Once we receive the email, a customer service representative will be in touch with you shortly. How do I accept freight shipments? When freight shipments are delivered, the recipient will be asked to sign a Bill of Lading, also known as a BOL. The BOL is the delivery receipt for freight shipments. Do not sign the BOL quite yet, as it is important to inspect the shipment prior to signing this BOL. When the BOL is signed, the recipient is acknowledging that the shipment was delivered in the expected condition. Inspect the delivery for any damaged or missing items. Freight companies are required to allow the recipient to inspect the shipment. While each company’s time limit may vary, it is important the recipient inspect the shipment, even if they are unable to unwrap every item. Should there be any noticeable damage, take photos of any damage that the recipient sees. When accepting freight shipments, notate this damage on both the driver’s and recipient’s copy of the BOL. Ensure to have detailed information, such as “3 table tops were cracked”. It is better to record extensive information than not enough. Count the items received to ensure there are not any missing pieces. Match the quantity to the ones listed on the BOL. Should items be missing, cross out the quantity on the BOL and write down the quantity received. Should there be any damaged or missing items, it is crucial to have the driver initial both copies of the BOL. What is freight shipping and freight services? Orders shipped via freight means the order will arrive packaged on a pallet. Our free freight shipping includes notify prior to delivery. Additional freight services are available at the customer’s expense. Notify Prior to Delivery: The freight carrier will call 24-48 hours ahead to schedule a delivery window. This service is included with our free freight shipping. Lift-Gate Service: The freight driver will place the pallet on a lift-gate and lower the pallet to ground-level. This is a curbside delivery service only. Freight drivers will not move the pallet to any other location. It will be the customer’s responsibility to move the pallet, or remove the item(s) from the pallet into their own location. Lift-Gate Service is an additional $70. Inside Delivery Service: The freight driver will move the pallet from the truck (if a loading dock is available) or from the lift-gate to the nearest, most accessible building entrance. Inside delivery does not include delivery to a specific room within a building, delivery up stairs, or delivery to a specific location via an elevator. Inside Delivery Service is an additional $115. Freight shipping is calculated upon ordering on the website for Canada, Hawaii and Alaska orders. Rates & services for freight shipping are determined at the time orders are placed. Expedited shipping may also be available. For more information, please contact us at info@multitable.com or call 602.773.6911. Is a height adjustable standing desk really going to work for me? We built our first height adjustable standing desks based on our own needs over 7 years ago , and we still stand behind our ergonomic products today! You have nothing to lose with our 30-day money-back risk-free guarantee. You’ll have the freedom to sit or stand during your day. Is the electric standing desk frame programmable? Yes, our MultiTable Electric Standing Desk Frame can be programmed with preset heights or to custom heights as your needs change, with the addition of the memory preset switch. Why are the standing desks and frames either manual or electric, but not both? At MultiTable, quality is crucial. We believe that our height adjustable stand up desks simply outperform and outlast other options because they are crafted with consistent function parameters in mind. Can I modify my standing desk into a treadmill standing desk? Absolutely! You will need a platform treadmill with no upper rails. We recommend contacting Lifespan Fitness for a treadmill that will safely work with our standing desks. Our team can assist with the modification process. Is there a cable management system? You bet! The MultiTable Cable Management Tray is designed to lift cords out of sight so you can maximize the free space around your electronics and keep your office looking neat and tidy. The simple, sleek, and versatile design can also double as a drawer that fits under your height adjustable standing desk for easy access to tools. Are custom standing desk tops available? In addition to the standard finishes crafted in-house we offer with our standing desks, MultiTable also offers hundreds specialty materials and finishes for custom height adjustable standing desk orders. Call our stand up desk design team at 602.773.6911 or email sales@multitable.com to get started on creating the height adjustable standing desk of your dreams. Are custom standing desk frame finishes available? Our standard standing desk frame finishes can work with any décor, but we are able to customize the powder coat color with a minimum order of 10 frames. Call our height adjustable standing desk design team at 602.773.6911 or email sales@multitable.com for more information on placing a custom order. 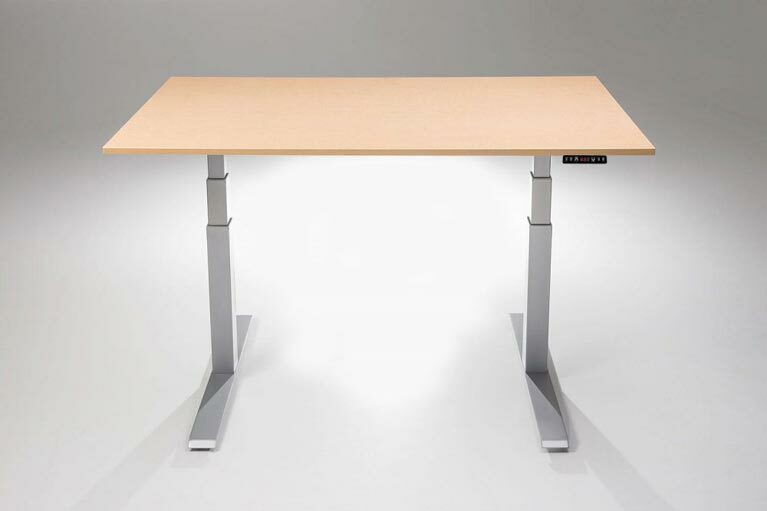 Uneven legs on a Multitable height adjustable standing desk? There are two sets of screws on each side of the drive shaft. Loosen all four set of screws on the drive shaft using the mid-sized Allen wrench provided. Adjust the right leg of the standing desk frame so that it is level with the left leg of the frame. Tighten all four sets of screws. The standing desk frame should now be level and ready to use as normal. Turn your desktop upside down on a flat surface. Make sure the bolts that attach the feet to the legs are fully tightened. Loosen the bolts that attach the top supports to the leg. Make sure the top supports are level and flush against the tabletop, then re-tighten the bolts. Ensure your desktop is fastened securely to the base. Press the down button. The base will go down very slowly. Hold the down button until the frame reaches the very bottom. Continue holding until you hear two clicks. Your electric standing desk frame should now be reset and ready to use as normal. I’m interested in carrying Multitable standing desk products in my store. How do I make it happen? Thank you for believing in our height adjustable products as much as we do! Please contact our ergonomic standing desk experts directly at sales@multitable.com or call 602.773.6911 for information about becoming a MultiTable height adjustable standing desk dealer. What happens if my standing desk order is damaged during shipping? If your MultiTable standing desk product is delivered with obvious signs of damage, please refuse the shipment, if possible, and the damaged product will be sent back to us. If you discover the damage after accepting shipment, please contact customerservice@multitable.com or call 602.773.6911 for instructions on replacing the damaged item. We will promptly send the replacement once we receive the damaged item. We aren’t happy if you aren’t happy. To ensure all of our customers are satisfied, we offer a 30-day no-risk money-back guarantee on all of our standing desks. If you wish to exchange your MultiTable ergonomic product, please call us at 602.773.6911 or contact customerservice@multitable.com for an exchange authorization number. We do ask that the product be returned in its original packaging and is in sellable, ‘like new’ condition. We will promptly send your replacements to you upon receipt of the exchanged items. Please note: shipping and handling costs for the original item(s) are nonrefundable. Buyer also pays for shipping and handling costs of replacement item(s). To ensure all of our customers are satisfied, we offer a 30-day no-risk money-back guarantee on all of our standing desks. If you decide your MultiTable product does not meet your needs, please send it back for a full refund. We only ask the product be returned in its original packaging and in sellable, ‘like new’ condition. Simply email us at customerservice@multitable.com or call 602.773.6911 for a return authorization number. Can I pick up my standing desk order to save on shipping? Of course! MultiTable is located at: 2255 W Desert Cove Ave., Suite E Phoenix, AZ 85029. All local pickup orders must be processed over the phone. Please call our height adjustable standing desk experts at 602.773.6911 or email info@multitable.com to arrange a pick-up date and time. Absolutely! We can ship your order to the destination of your choosing. For an international shipping estimate, please contact our standing desk team at info@multitable.com or call toll free at 855-469-6858. Please Note: All flat rate shipping costs outside of the contiguous U.S. do not include duty or tax. Payment for these fees is the sole responsibility of the customer. What are your flat shipping rates? What are my standing desk shipping options? We typically offer free ground or freight shipping on all orders within the contiguous United States. Any order with Large or Extra-Large Table Tops will be shipped freight (on a pallet). Our free freight shipping includes the service Notify Prior to Delivery. Other freight services, such as Lift Gate and Inside Delivery, are also available at an additional cost. Flat rate shipping is calculated upon ordering on the website for Canada, Hawaii and Alaska orders. However, we also have other shipping options available for our ergonomic products. Rates & services for shipping are determined at the time large orders are placed. Expedited shipping is also available. For more information, please contact us at info@multitable.com or call 602.773.6911. Can I use my own desktop? Our standing desk bases can be sold separately, but do keep the dimensional requirements in mind if installing your own desktop. Email info@multitable.com or call 602.773.6911 for more information. Our ergonomic experts can help you find the right base for your size desktop, and may be able to assist with installation of your standing desk base. What are our standing desk table tops made of? All MultiTable standing desks feature high-quality Wilsonart® thermally-fused laminate (TFL) ¾”-thick desktops. We manufacture our standing desk table tops in-house using a CNC machine. Our production team models your table top for perfect fitment and tolerance before finishing with a smooth, color-matching 2mm edge banding. MultiTable takes pride in crafting the highest quality and most durable standing desk table tops in the business. While we offer our height adjustable standing desk table tops in five in-stock matte finish colors and four standard sizes, we also offer hundreds of Wilsonart® TFL laminate color choices to special order. Our engineers are happy to work with you to create a customized desk at almost any size. What are our standing desk frames made of? Our long lasting high quality height adjustable standing desk frames are constructed of powder-coated, rolled-stamped steel and are finished in a variety of classic colors that complement any décor. 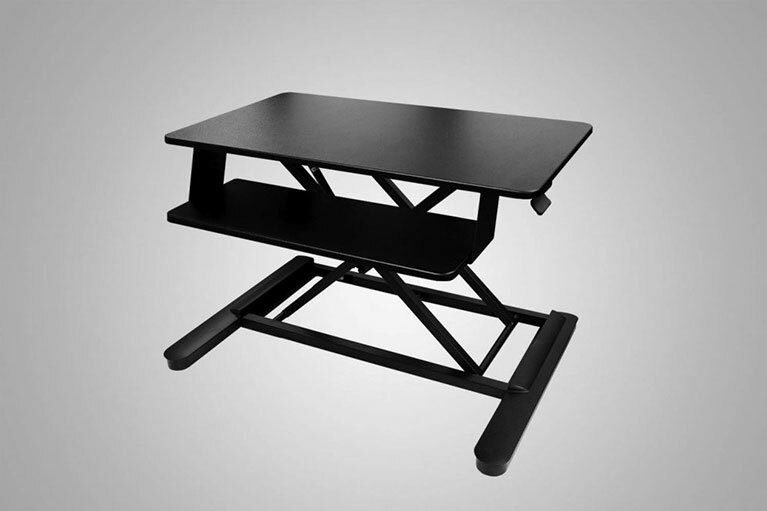 We manufacture one of the highest rated standing desk frames on the market today. How much weight can our standing desk frames support? 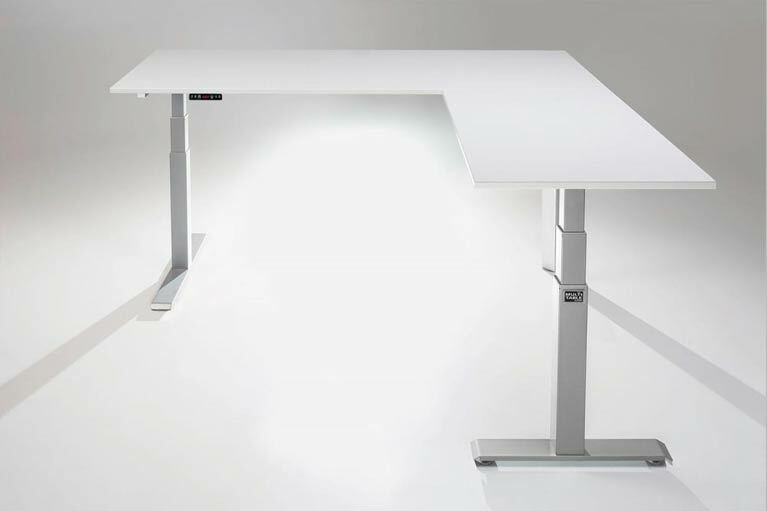 We recommend distributing the weight evenly over your standing desk table top to guarantee a smooth operation of your MultiTable height adjustable frame. 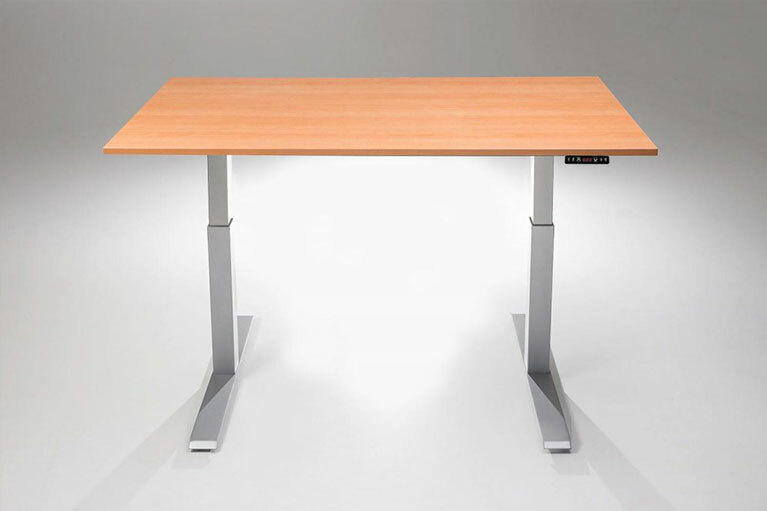 Are your standing desk products guaranteed? Absolutely! We stand behind our height adjustable standing desk products (no pun intended) with a 30-day, money-back, risk-free 100% satisfaction guarantee. View our return policy on this FAQ page. What’s the warranty on your height adjustable standing desk frames and table tops? 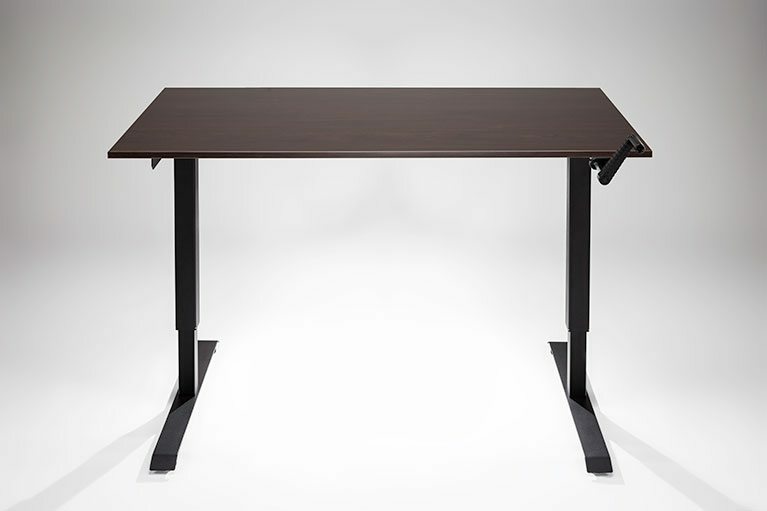 All of our height adjustable standing desk frames and table tops carry a limited 5-year warranty from the date of purchase on any defective materials, workmanship, moving parts, and on the steel of the frames. We will completely replace any defective part within that 5-year period. After the 5-year warranty expires, we will do our best to correct any issue at the lowest possible cost. Our goal is always your satisfaction. How do I know my online standing desk purchase will be a secure transaction? Our website offers Secured Checkout by Authorize.net and is fully secured with Komodo 128bit SSL security. We are also a PayPal verified merchant. If you’re still unsure about ordering securely online, please feel free to contact us at sales@multitable.com or 602.773.6911 and place your order directly with our team of standing desk experts. When will my standing desk order be shipped? Most standing desk and accessory orders are shipped same day if ordered by 12:00 noon Arizona time, but some orders ship within 1 to 3 business days from the order date depending on size and custom work required. Shipping within the contiguous U.S. typically takes 2 to 7 business days via UPS Ground. For information on alternative delivery methods, questions about your order, or for more information, please email customerservice@multitable.com or call 602.773.6911. How will I know my standing desk order has been processed? Every MultiTable standing desk and accessory order is followed with a confirmation email. If you detect an error in your standing desk order, or do not receive the confirmation email within 30 minutes, please email customerservice@multitable.com or call 602.773.6911. We also send an email when the order ships with tracking information.